Insects raiding our homes is one of the most annoying problems. God forbid should you leave a dessert pizza box open on the couch from the night before. The next morning, you’re sure to see a thin moving line of sugar ants that have trailed through some hole into your house to bring pieces of that leftover pizza back to their colony. The worst part is that these sugar ants probably have set up their colony nearby or inside your house, which makes it even more difficult to wipe them out once for all. Sugar ants get their name from their behavior towards food. These ants are attracted to food, especially anything that is sweet and sugary. How do they know where you keep the food? Well! These ants have a higher sense of smell than humans. Also, once they get to the food, as they carry crumbs back to their colonies they leave behind a trail of their pheromones that is like road signs for other ants to follow. Their size varies from between 2 to 15 mm, and they can be different colors. The male sugar ants are black, and the females have bands of orange and brown on them. They not only feed off your food, but they also have pincers with which they can sting you. They are generally not poisonous, but the bites can give you red and itchy bumps. It’s always best to bait the ants with poisoned food rather than killing them directly. This ensures that they take the poisoned food back to their colonies, which eventually destroys the source of the infestation. 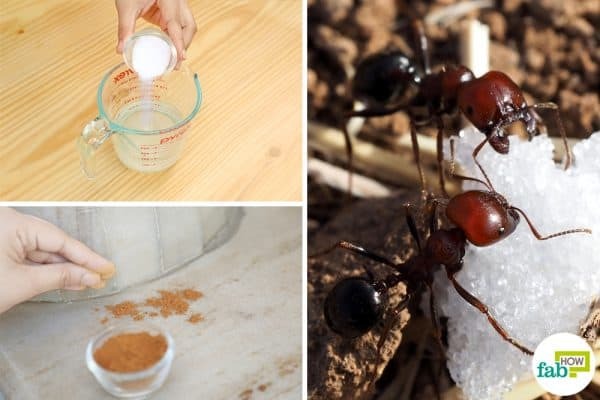 Here’s how you can get rid of sugar ants with six remedies that work every time for sugar ant invasion. A handy means of killing ants is using borax. It is made up of sodium borate or sodium tetraborate. Borax is known for its cleaning power and also is used as an herbicide, fungicide, a desiccant, and an insect killer. It is a common and active ingredient found in most commercial ant baits. It is an efficient method of getting rid of a colony of ants because it doesn’t kill them instantly. Upon ingestion, the borax affects the ants’ digestive system, while still leaving time for them to take the poisoned food back to their colonies. When they share their “spoils” with their fellow ants, in due course, it kills the other ants, too. However, sugar ants won’t be attracted to borax alone. You have to mix it with something sweet like sugar or honey to prepare the bait. 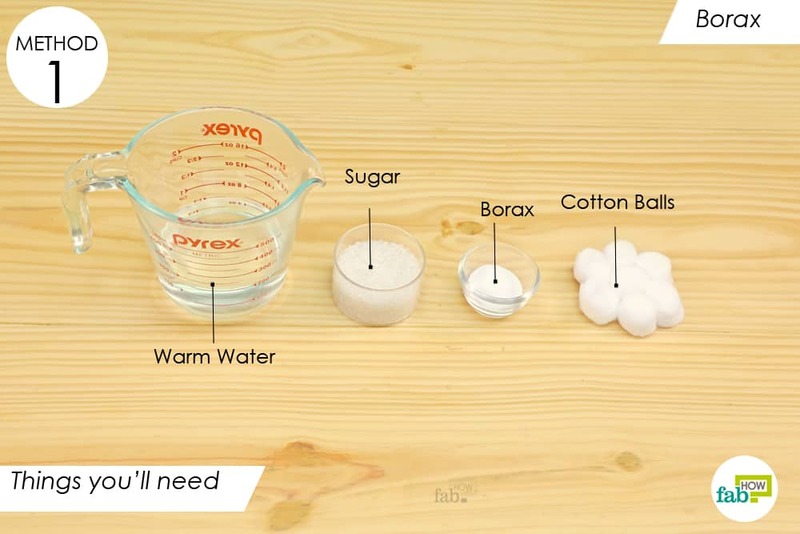 You can find borax in the laundry aisle of any supermarket. Pour a 3/4 cup of warm water into a container. Add 1 tablespoon of borax. 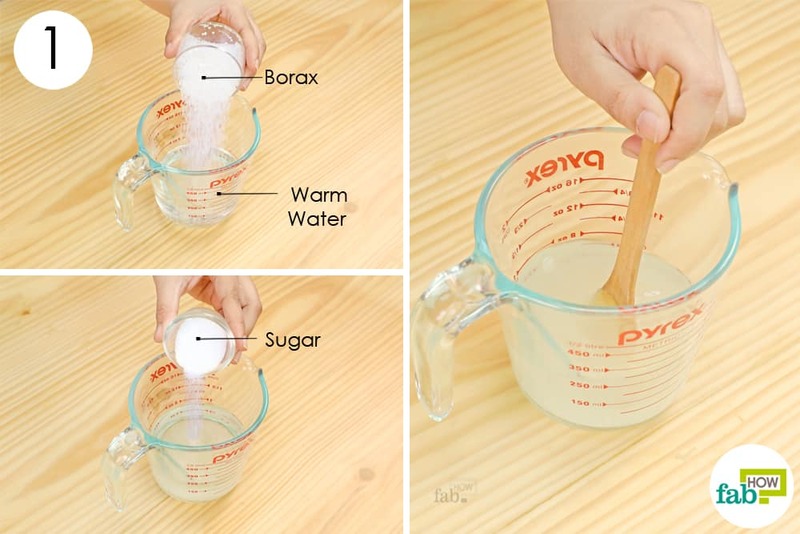 Add 1/4 cup of sugar and stir the mixture until the borax and sugar dissolve in the water. 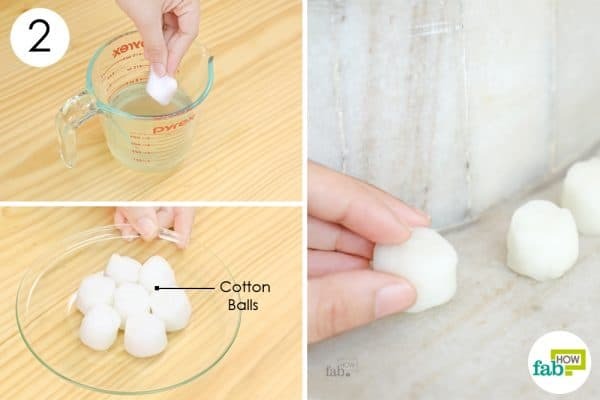 Soak a few cotton balls in the solution and place them on the ant trails. Store the leftover solution in a jar in a cool and dry place for future use. Make sure it’s tightly sealed and labeled. This solution can be stored for as long as you want, without losing its potency. Caution: Borax is very toxic to humans and pets. Keep the solution out of children’s reach. The food-grade diatomaceous earth (DE) is a talc-like powder made of fossilized marine phytoplankton, a type of algae. A little bit of DE, when sprinkled on anthropods or invertebrate animals, desiccates them. It damages the waxy coating on the sugar ants and kills them. You can also use DE to get rid of termites. However, with this method, you cannot destroy the entire ant colony, unless you know its location. But it will stop the sugar ants from making any further progress. The food-grade DE is safe for humans. It does not smell and can be used indoors safely. It can also be consumed, as it is rich in silica that is good for your hair and nails. Sprinkle a thin line of food-grade DE on the ant trail or the perimeter of your house. Dust it around cracks, holes or any kind of inlet into the house. DE is effective only when it is dry. Store the remaining DE in an airtight container. Caution: DE used to filter pools is not safe to inhale. One of the non-toxic and easy ways to rid of sugar ants is using vinegar on the ant trails. Vinegar has a strong, pungent and rancid smell. The acetic acid present in vinegar gives it the distinct smell. The smell of vinegar highly repels sugar ants. It also helps in throwing off the smell of pheromone tracks created by the ants. You can also learn how to get rid of spiders using vinegar. 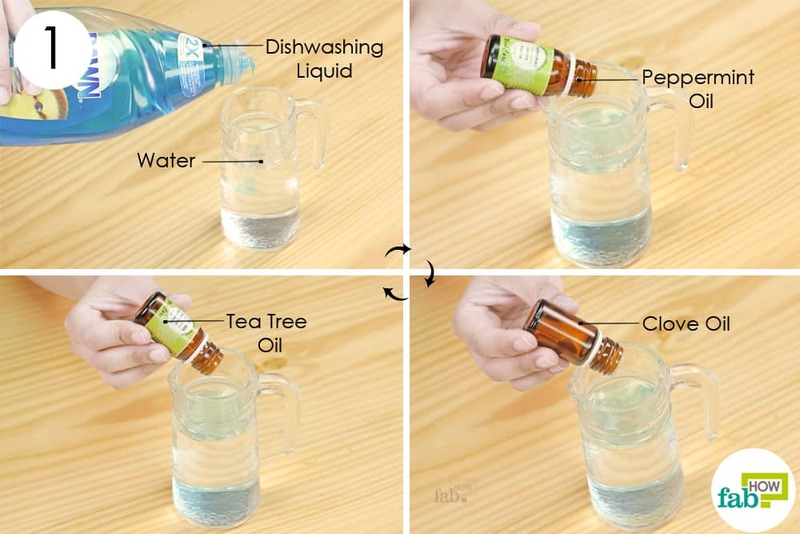 Pour 1 cup each of vinegar and water into a spray bottle. 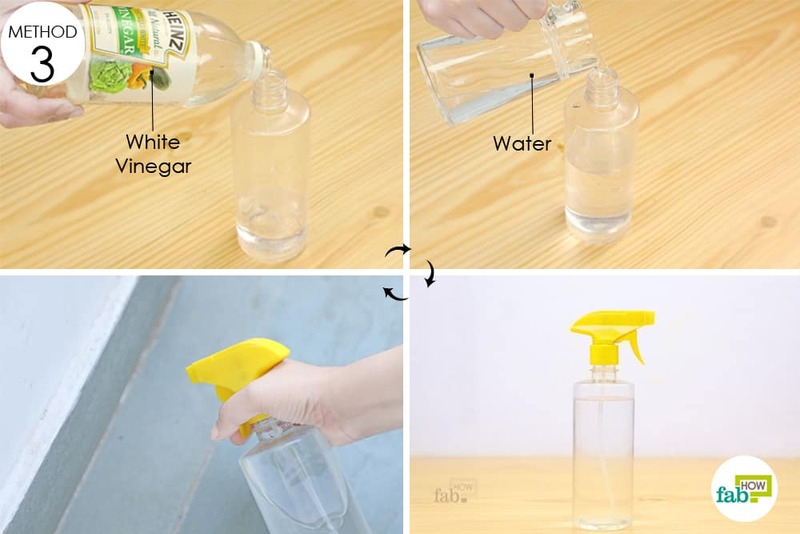 Shake the spray bottle to mix the solution. Spray the solution on the ant trails, cracks in the wall, drainage holes, window sills, entrances to the house, near the garbage cans and under the cabinets. Since vinegar is acidic, it stores for a long time without going bad. However, store the spray bottle in a cool dark place. Another non-toxic ingredient that can kill the sugar ants efficiently is baking soda. Baking soda consists of small crystals of salt composed of sodium ions and bicarbonate ions, in the form of powder. When the sugar ants consume the baking soda, it reacts with the acid in their digestive system and generates carbon dioxide as a by-product gas, which makes them explode. 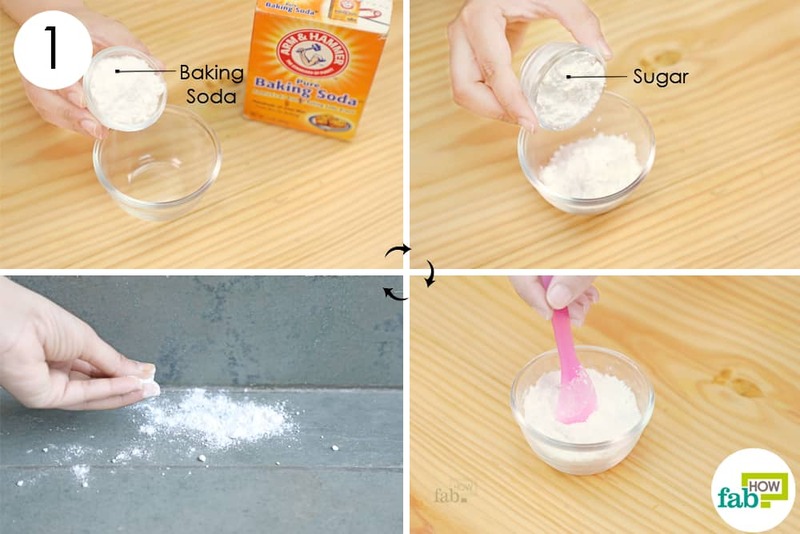 Mixing the baking soda with powdered sugar acts as bait for the sugar ants. This method can be very effective because the ants take the small crystals of sugar mixed with the baking soda back to their colonies, which destroys the problem at the root. This is also one of the safest methods for those of you with kids and pets at home to get rid of roaches. 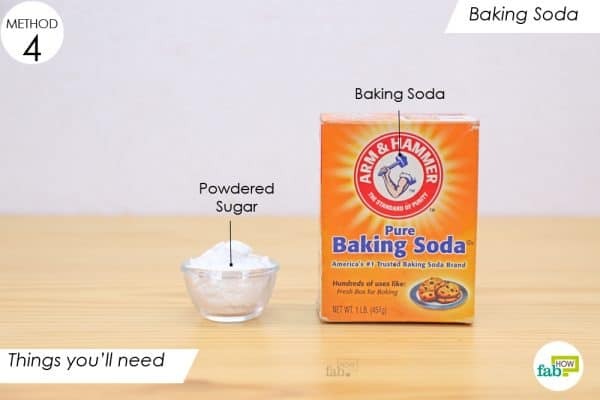 Put 2 tablespoons each of baking soda and powdered sugar in a bowl. Dust the baking soda and sugar powder mix on the ant trails. You can also use a jar lid to place the mixture at strategic locations. Store the leftover mixture in a cool and dry place. 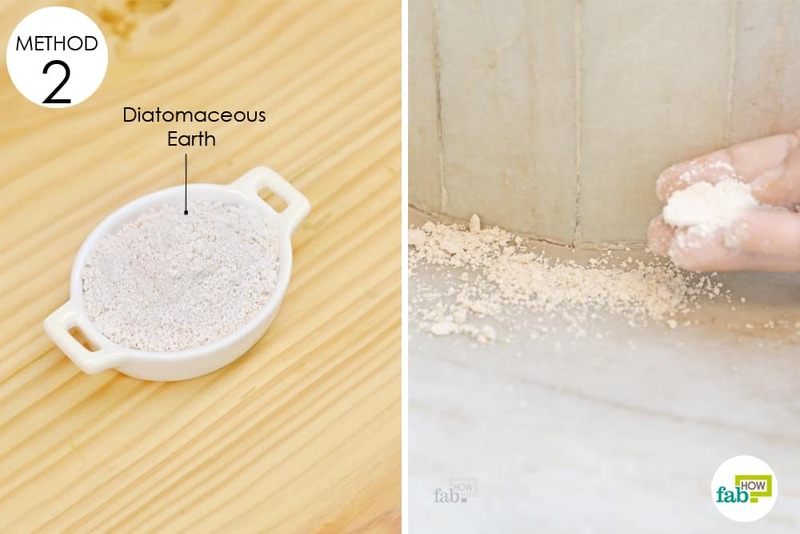 Since it is a dry powder solution, you can store it for a long time. The sugar ants communicate the food’s location to other ants by releasing pheromones on their path. The other sugar ants pick up that smell, and that’s how they form a trail to the food from their colonies. Humans can not track the pheromones, but it is like a GPS system for the ants. 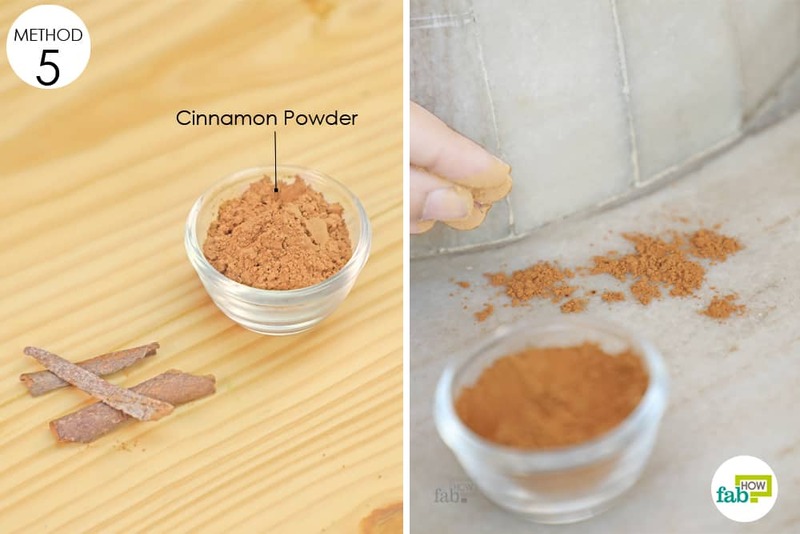 Cinnamon is a strong spice, which prevents infestation by silverfish, ants, etc. Sprinkling cinnamon on the ant trails throws off the smell of pheromones and confuses the sugar ants. Cinnamon is not likely to kill them immediately. However, it repels them and prevents them from further multiplying. Sprinkle cinnamon powder around the house wherever you find ant tracks. The use of essential oils can prove very useful in keeping sugar ants at bay. Along with other properties, these oils have strong fragrances that interfere with the pheromones released by the sugar ants to make their trail. Lemon oil is a citrus oil that contains d-limonene, which is a toxic substance for sugar ants. It can penetrate the ants’ hard and waxy exoskeleton and kill them. Peppermint oil contains menthol, which effectively repels sugar ants, cockroaches, mice, and rats. Ants also hate the smell of tea tree essential oil, which can be used successfully to deter the pests. Clove oil is a fast-acting contact insecticide, with minimum risk of damage to the environment. This remedy also uses dish soap, another ingredient that dries out the sugar ants’ exoskeleton and causes them to die from dehydration. 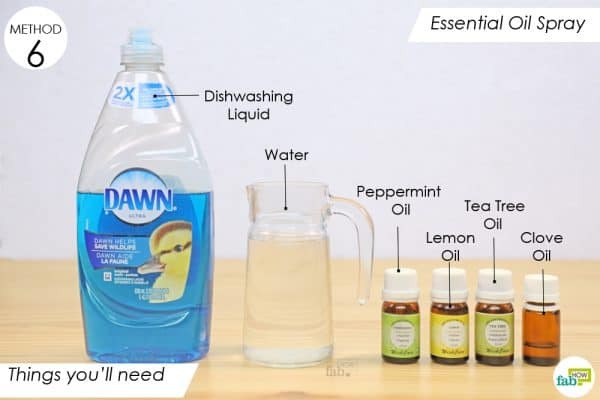 Add ½ teaspoon of dishwashing liquid. Add 3 to 5 drops each of peppermint oil, clove oil, and tea tree oil. 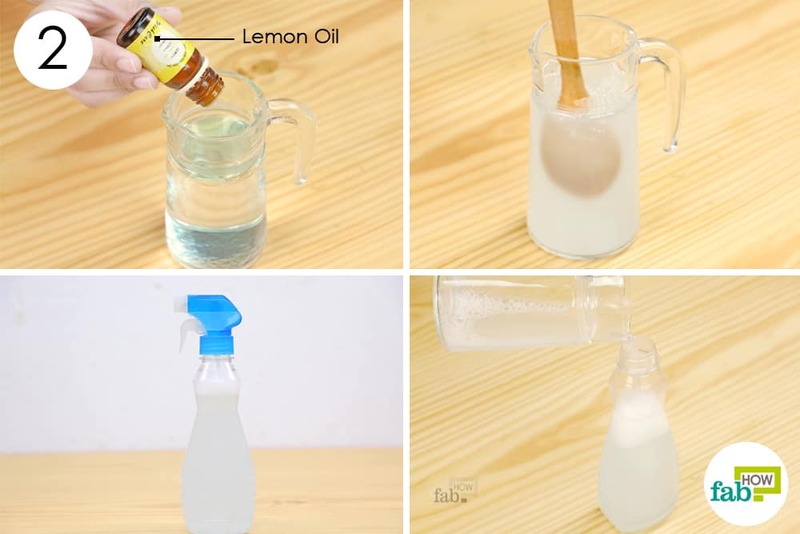 Add 3 to 5 drops of lemon oil to the mixture and stir it to blend all the ingredients. Spray the solution on the ant trails, holes or cracks near the window sills or the walls near the entrance doors and fireplace, etc. to get rid of sugar ants. This solution requires multiple applications. The essential oils are primarily contact-killing agents, so keep reapplying the solution until you no longer see any sugar ants. 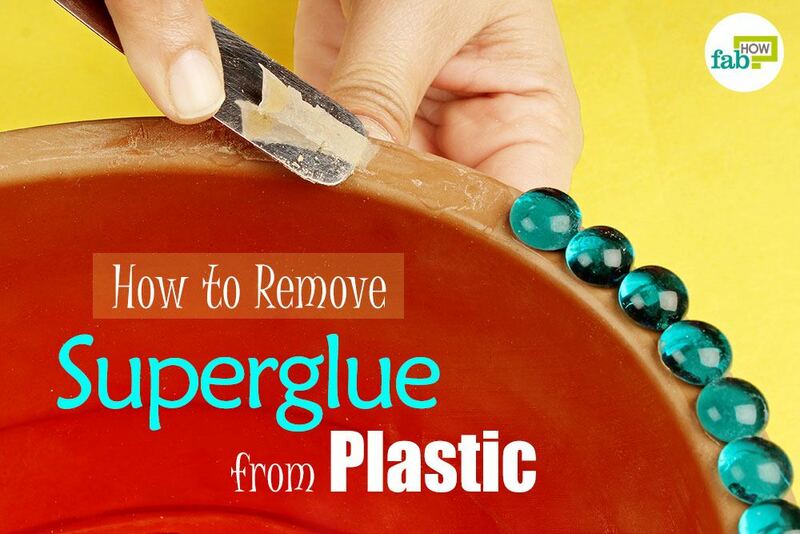 Remove the sources of food lying around in your house like small crumbs of sweets and biscuits. The sugar ants are in your house because the food attracts them. Don’t leave food out on the counter, tables, dining table or at bedside areas. Wipe the dining tables & kitchen countertops with disinfectant. Store your food in airtight containers. Seal the garbage bin tightly and empty it on time. Keep the sink and the surrounding area clean. If you identify where the sugar ants are getting inside the house, make sure to caulk the opening. Thank You for valuable useful info. Glad you liked the info we provided.